We are the distinguished and leading manufacturers and exporters of Alloy Steel Rods. Our assortments of alloy steel rods are of international standard and made with premium quality raw material. 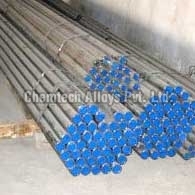 The Alloy Steel Rods we produce are in high demand and can be used in various industries. Customer satisfaction is of utmost priority and hence best competitive price are fixed for the Alloy Steel Rods.